Our latest project acquisition is the renovation of a 1974 house in a heavily wooded site in Annapolis MD. True to its time, the existing house consist of two separate volumes connected by a 2nd story bridge, and features an overly prominent roof lines, garage as ‘front door,’ a sunken conversation pit and oddly located outdoor jacuzzi, among many other charming, slightly retro features. It has been virtually untouched since its construction, presenting the new owners the opportunity of living in a contemporary home that meets their taste and needs, on a beautiful wooded site for a relatively smaller level of investment than purchasing an already renovated house. Below are some images of the exterior of the existing house. 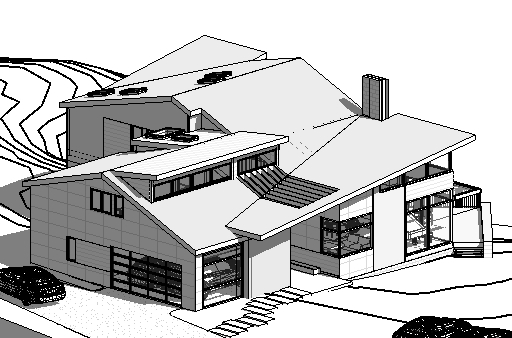 The proposed design involves a full interior renovation, connecting the two separate volumes and rooflines, breaking down the scale of the roofs, relocating the garage door, new siding and windows throughout, new roofing. 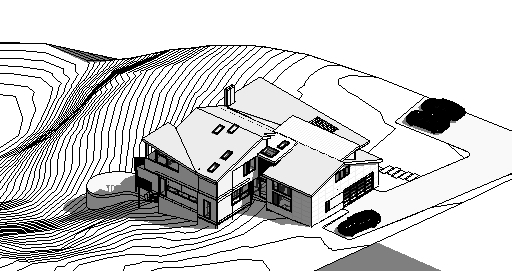 The creation of a welcoming front to the house through the addition of a new double height entrance vestibule between the two existing volumes was a crucial design decision early on in schematic design, and it has set in motion a sequence of design moves that effectively transform the house. An important focus in this project is the application of sustainable principles for energy conservation and material choices. Geothermal heating/cooling is in the program for the project, along energy efficient lighting, cement board siding, energy efficient windows, etc. Here are some initial views of the proposed modifications to the exterior of the house. More to come.